A $15-an-hour minimum wage will cost the province's businesses billions, a new analysis warns. Ontario Premier Kathleen Wynne's government has announced labour reforms that include a significant minimum wage hike to $15 per hour. TORONTO — The Ontario government's plan for major labour reforms would have significant side effects that would put 185,000 jobs at risk, a coalition of business groups said Monday in releasing part of its analysis on the proposed legislation. The economic analysis commissioned by the Keep Ontario Working Coalition found that Ontario businesses stand to take a $23-billion hit within two years of the implementation of Bill 148, largely due to a minimum wage increase. The coalition, which includes groups such as the Ontario Chamber of Commerce and the Retail Council of Canada, said the changes proposed in the bill would force employers to find creative ways to cut costs, such as hiring less and increasing automation. "The changes presented in Bill 148 will have dramatic unintended consequences that include putting close to 200,000 jobs at risk and seeing everyday consumer goods and services increase by thousands of dollars for each and every family in Ontario," said Karl Baldauf, a spokesman for the coalition. He said the reforms are "too much, too soon," echoing concerns expressed by business groups since the minimum wage increase was announced. Key figures of the analysis were made public Monday and more findings are expected to be released in the weeks and months to come, the group said. The proposed legislation would, among other things, raise the minimum wage to $15 an hour, require equal pay for part-time workers and expand personal emergency leave. The bill would boost the minimum wage, which is currently set to rise with inflation from $11.40 an hour to $11.60 in October, up to $14 on Jan. 1, 2018, and $15 the following year. "Making $15 an hour is great but only if you have a job," Baldauf said. Ontario's Ministry of Labour said it was reviewing the findings, but noted the study is one among many. "Many businesses across the province have come out in support of our plan because it helps them attract employees, reduces their labour turnover and encourages employees to become more invested in the business," Labour Minister Kevin Flynn said in a statement. The government is committed to working with the business community and recognizes it has concerns, the minister said. "That being said, we will not back down from our plan to bring fairness to Ontarians," he said. "We will remain in the corner of those families who are counting on these supports." Ontario Labour Minister Kevin Flynn in the legislature at Queen's Park in Toronto on May 25, 2015. 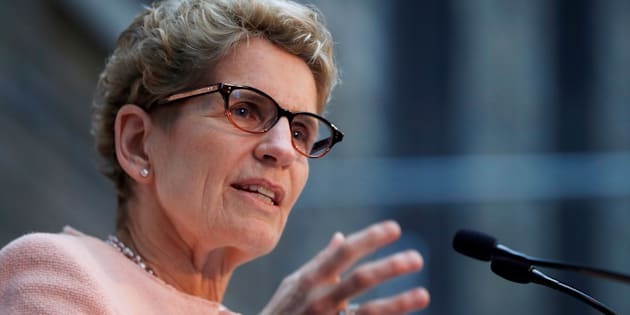 Premier Kathleen Wynne has said she is working on ideas to support Ontario businesses through major labour reforms, but has yet to say exactly what form this relief would take. Economic Development Minister Brad Duguid has also suggested the province was looking at reducing other costs for businesses to help them cope with the labour changes. The Canadian Centre for Policy Alternatives, a national think tank, said the numbers released Monday represent a worst-case scenario that research suggests is unlikely to pan out. David Macdonald, the centre's senior economist, said similar predictions have been made in other jurisdictions ahead of minimum-wage hikes but there has in fact been "little impact on employment." He also said the analysis doesn't reflect that employees earning more will also spend more, or that businesses will see gains in productivity and save on training costs by better retaining their staff. "Those pieces balance themselves out," he said. The Canadian Centre for Economic Analysis conducted the study, which examines the impact of six key areas of reform, namely changes to the minimum wage, equal pay provisions, vacation, scheduling, personal emergency leave and unionization. The centre said both current and potential new jobs would be at risk in the first two years of the plan. It projects the number of jobs will be 2.4 per cent lower under the proposed legislation. Small business owners will be more affected, as will women, who are more likely to hold lower-paying jobs, said Paul Smetanin, the organization's president. The coalition said labour reforms should be introduced more gradually but did not recommend a particular timeline. It also renewed its calls for the government to conduct an economic analysis of its own.